The keys of Roth's sax clacked like claws on stone beneath the mercurial, bubbling sounds of the feedback. On Saturday morning in The Mick Lally Theatre's lobby, Galway Jazz Festival's Pop Up Record Shop sold the works and wares of the festival's many performers. Meanwhile, over the customers' heads in a loft rehearsal space, Toner Quinn from the Journal Of Music led the "Brexit Schmexit" panel. The Irish artistic community's unspoken fears of Brexit were at last said aloud, robbing those fears of some power. At high noon in the Nuns' Island Theatre, Jasmine Flowers, "an exciting project combining Javanese Gamelan, improvisation, and electronic music," played their unique song for the crowd. At the same time in Massimo Bar, Nigel Mooney and The Johnny Taylor Trio set the air alight with their music. Back in the Black Gate Cultural Centre's candle-lit basement beneath Eglinton Street, Nick Roth debuted his most ambitious work. Until the improvised encore, Roth alone made all the music by recording and looping it through his laptop and venue's audio. Field recordings Roth made on a trip to Java were the only pre-recorded part of the performance. Every other note of music was played as thrillingly and shockingly live as a human brain's bioelectricity. It began just as Roth described it to the crowd: with feedback tones from his alto saxophone, as deep and open as the Mariana Trench. The keys of Roth's sax clacked like claws on stone beneath the mercurial, bubbling sounds of the feedback. Roth seemed to be sculpting the airwaves; they dripped with the wet sonic clay he molded beneath his fingers. He rocked back and forth as the tones pulsed and throbbed, sending air whooshing through his horn in great lungfuls. A scraping, abrasive sound above the quiet rhythm of the feedback was joined by the atmospheric recording of tropical rainfall on a jungle's massive leaves. Roth then put down his alto and turned to the piano. For a split second, there was only the light sound of the raindrops, until the piano's notes started to echo spectrally through the basement, chased by a low, tolling note from the left-hand side of the keyboard. Roth let gentle jazz chords fly that offset the natural ambience of the loops and the upright piano's notes. The dissonance grew as he moved to higher cluster chords and the groove rolled in on fractured limbs. Cecil Taylor-esque chordal blasts moved through to a classical figure, which retreated back into free jazz territory. Roth then moved from the piano to the soprano sax for Pharoah Sanders-like free jazz squeals through to an almost traditional New Orleans lick. Back on piano, he sweetened the air with mellower chords before returning to the dark, menacing undercurrent that flowed through the whole 40-minute piece. The loop of soft pattering rainfall on undergrowth played the whole time. Roth moved back to the soprano and the songs of birds of paradise offset its violent leaps and honks as well as his rocking back and forth. He paused to tap a key on the laptop, cueing a loop of his last few licks. He bounced a chord off the piano's keys as the music of the tropics dropped away. Walking a bass line across the left-hand keys, a huge big band chord ushered in a duel between both hands. Once more, a fresh loop began, this time of the piano, and Roth picked up his alto once more and reacted to the loops' movement with spontaneous energy. Finally, he picked up his soprano one last time to end the work on a long low note. Roth congratulated the crowd on sitting through a piece that many would describe as "difficult" yet would be more aptly described as "brilliant." It is too rare nowadays for an artist to make music that is both as complex and brilliant as that of Roth at Galway. When bass clarinetist and assistant festival programmer Matthew Berrill and pianist Huw Warren joined Roth for an encore, they made brilliance on the spot, improvising a shining flash of music right then and there likely never to be repeated again. Many of the same faces were present once again in the Mick Lally Theatre that afternoon. 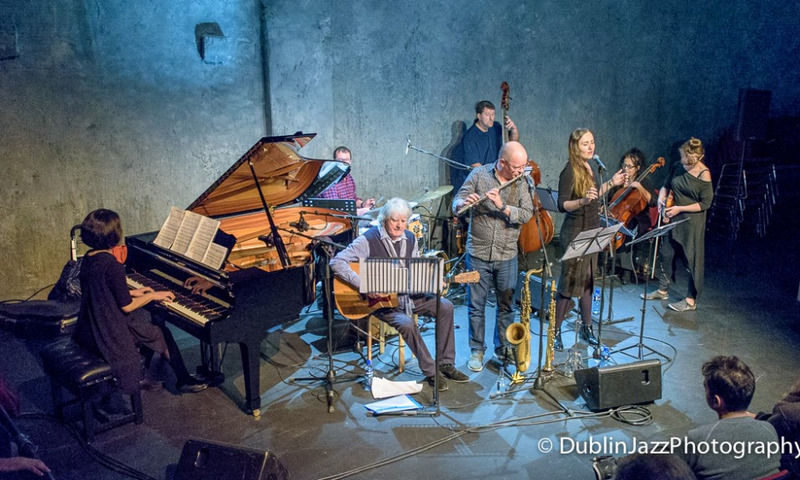 Tommy Halferty's nonet walked the crowd through his Seven Musical Steps To Camus, a suite detailing the life and works of philosopher/writer Albert Camus. Halferty deftly moved the audience from the suite's opening through "The Stranger" and "The Fall" as well as a gorgeous epilogue in which Michael Buckley's flute and Aleka Potinga's voice moved in unison through the stratospheric melody.